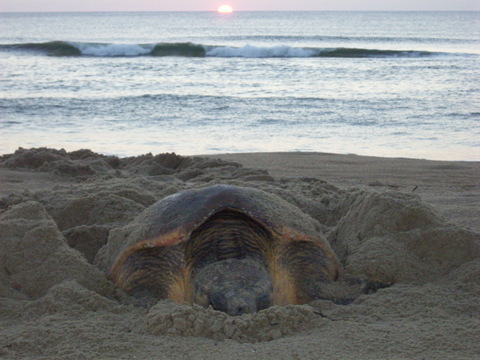 A loggerhead sea turtle finishing her nest early in the morning. 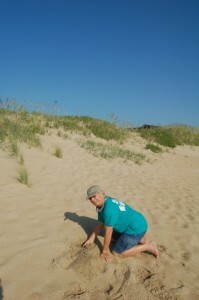 On a morning jog beach goer Larry came across this turtle hauled out laying eggs on the high berm. Perhaps more amazing than his coming across this lucky sight was that he was able to wake his teenage son, Zack, who came out to witness the rest. Nest #23 with an unusually elongated nest site. 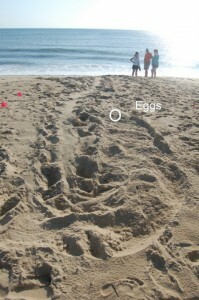 The turtle had left a rather unusually long nest site with two suspect areas where the team thought the eggs might be. So working together, they began to excavate the site. 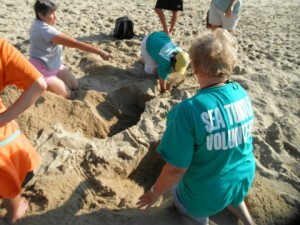 Nesting Responders dig at the two suspect sites to find the eggs. Rick begins digging the nest's new chamber directly behind the original site but further up the beach above the high tide line. on a weekly basis. So today it was high and dry but next week, it may be the new swale formed by the incoming tide. The nest would need to be relocated to stable ground. 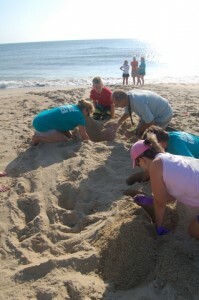 So some Nesting Responders carefully moved one egg at a time to a cooler while others dug the new digs. Rae and Patti measure the width at the "bowl" of the egg chamber. 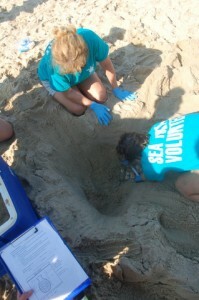 Before responders could even pack up and head out to Nest #23, Charlotte gets a call about another crawl in Nags Head. Could it actually be another nest?! Or maybe it was an earlier attempt (false crawl) by our mother from Nest #23. Once the Fitz’s arrive on scene, we knew for sure. 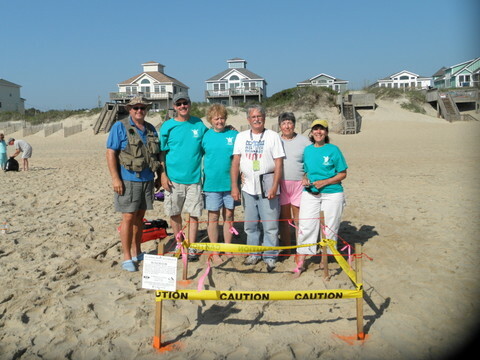 We had two nests in Nags Head on the same day! Nesting responders search for eggs. Fortunately for this team, the mom chose a great spot away from the tide line and on stable ground so this nest would be okay where it was at. Penny uncovers the egg chamber. The team worked to locate the eggs and as I am told, Susan worked her magic and found the chamber. After collecting the DNA sample, the eggs were covered back and the site was staked off for protection.